Star will keep on shining. Today, FOX announced they’ve ordered additional episodes for season two of the TV show. The drama follows three talented singers as they navigate the cut-throat music business on their road to success. The cast includes Queen Latifah, Benjamin Bratt, Jude Demorest, Ryan Destiny, and Brittany O’Grady. FOX has ordered five more episodes for season two of Star, bringing the season total to 18 episodes. The series airs on Wednesdays at 9 p.m. ET/PT. The Season Two premiere of STAR (2.4/9 L7) posted the series’ highest-rated telecast since its series debut, as well as its highest seven-day total multi-platform audience since the same date, delivering a seven-day total multi-platform audience of 7.5 million viewers. The drama also was up +20% from its Season One finale. 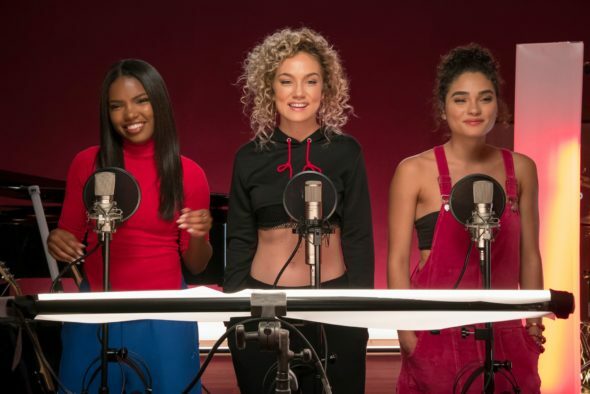 In the next all-new episode of STAR, “FUA… Good Night!,” airing Wednesday, Oct. 11 (9:00-10:00 PM ET/PT) on FOX, while preparing for an upcoming TV appearance with recording artist Noah Brooks (Luke James), the girls (Jude Demorest, Ryan Destiny and Brittany O’Grady) learn that they will be singing backup rather than co-headlining the performance. Anxious for the girls’ next big move, Carlotta (Queen Latifah) turns to the new A&R executive, Maurice (guest star Lance Gross), for help on a new deal. Meanwhile, Jahil (Benjamin Bratt) tries his hand at producing music, Cotton (Amiyah Scott) struggles with starting her new job and Star (Demorest) comes face-to-face with an unexpected person from her past. STAR is a production of 20th Century Fox Television in association with Lee Daniels Entertainment. Lee Daniels and Tom Donaghy are the creators and executive producers of the series. Pamela Oas Williams also serves as executive producer. Karin Gist serves as showrunner and executive producer. “Like” STAR on Facebook at facebook.com/STARonFOX. Follow the series on Twitter @STAR and join the discussion by using #Star. See photos and videos on Instagram by following @STARonFOX. What do you think? Do you watch Star? Are you enjoying season two so far?